Scroll bars: The scroll bars on the right edge and bottom edge of your project window let you see other areas of your current layout. Rulers: The units of measurement for the horizontal and vertical rulers (inches, centimeters, picas) are also specific to your current layout. Layout tabs: Click the tabs between the top ruler and your project’s title bar to move among the layouts in your project. Pasteboard: The rectangle in the center is your active page, and the gray area around it is called the Pasteboard, on which you can store picture boxes, text boxes, or any other page items until you’re ready to position them on that page. If your layout has multiple pages, the Pasteboard around your currently active page appears lighter than the Pasteboard around the other pages. Items that are contained completely on the Pasteboard don’t print. However, if any part of a Pasteboard item overlaps onto the page, that part will print (if you don’t explicitly forbid this in the Print or PDF Export dialog box). 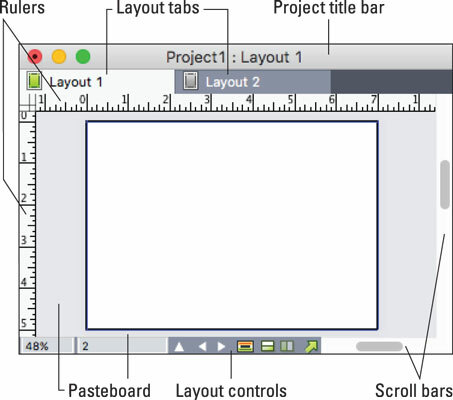 Layout controls: The Layout controls attached to the bottom left of your project window let you change the view percentage of your project, navigate to other pages within it, and print or export that layout, as shown.